When we saw the inkjet pritner, we thought it was a revolution. The digital textile printer vitalizes the world of the traditional craft. Installed printer: The digital textile inkjet printer "TX2-1600"
Kaga-yuzen is the traditional craft which represents Ishikawa prefecture. Kaga yu-zen is a dyeing method established in Edo era, which is made to accommodate the climate and natural feature of Kanazawa district. It is known for its fascinating colors, which is called Kaga Gosai including the color red, ocher, green, indigo, and purple. 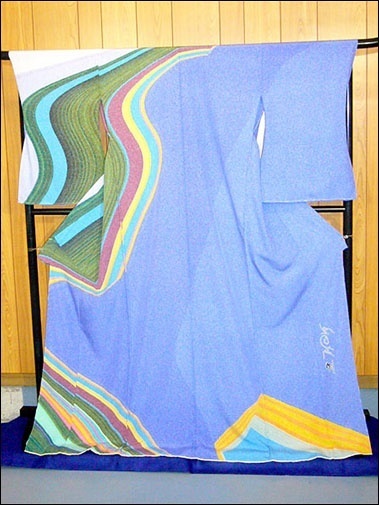 While Kyo yu-zen's pattern is artificial design, Kaga yu-zen's pattern is usually the graphic painting image such as grass, flower, and bird. 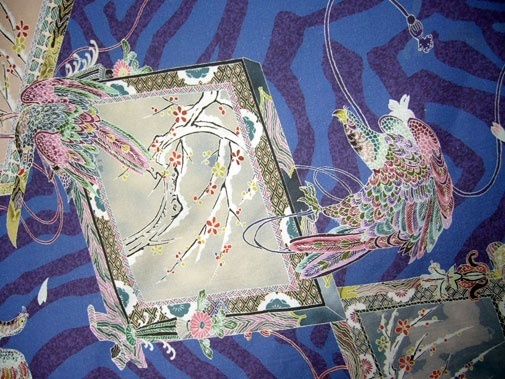 The original ornaments of "Ombre Dyeing" and "Wormhole Leaf" is also the feature of Kaga yu-zen. Mr. Okamoto, a Yu-zen writer, who runs "Okamoto Senkou" ― a craft center of Tegaki yu-zen ― creates Yuzen-dyeing with a traditional method. 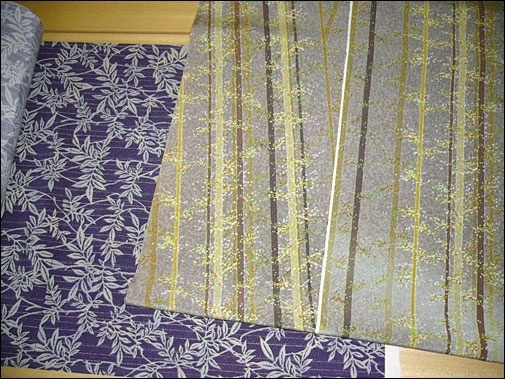 While leading the craftsmen, he deals with the commercialization of low cost dyeing by sending the data of Kaga yu-zen designed by himself to the computer, and print it out using Mimaki's injkjet printer. "We have been doing textile printing manually for several decades, but when we saw Mimaki's printer for the first time, we thought it was a revolution. Why can the dyeing be done with the printer? That was what we felt. It is splendid that once I create the design on the computer, then the printer reproduces the design. However, printing on the transfer paper and dyeing the cloth directly are different in quality. As a writer, it was hard to create satisfying works taking use of the printer because I cannot tell the finishing ― the quality or weight of the color from an objective standpoint ― until the color on the paper transfers on the cloth. "However, I still think it is revolutionary that the dyed clothing can be done by inkjet printer." 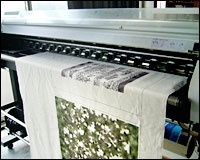 By printing directly on the cloth by inkjet printer, not by craftmen, the low cost dyeing is achieved. 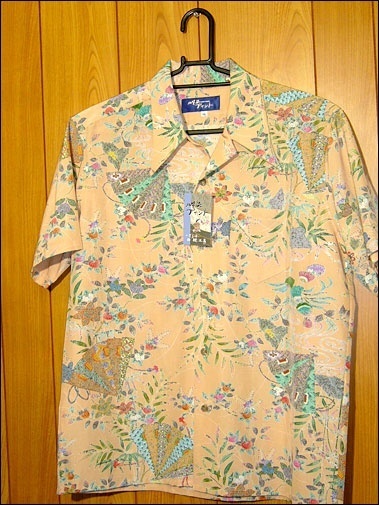 Mr. Okamoto makes and sells aloha shirt with the cloth which pattern is designed by himself. "It is often asked that why do I make and sell aloha shirt in Kanazawa. There are two reasons. One is its shape. 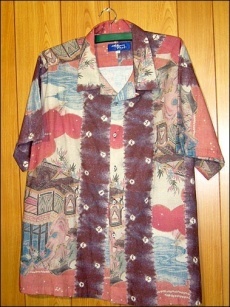 The shape of aloha shirt is fixed to some extent. It is troublesome in many ways if there are several patterns. The other is the motif. 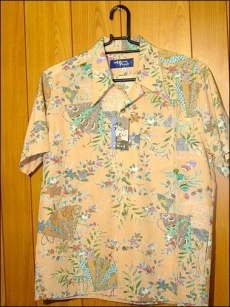 Aloha shirt is derived from Japanese cloth of Kimono. 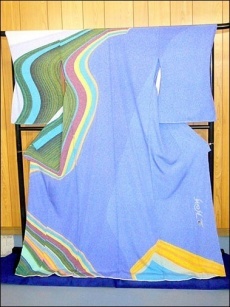 I thought Japanese pattern, such as the design of Yu-zen, can be effectiely utilized. 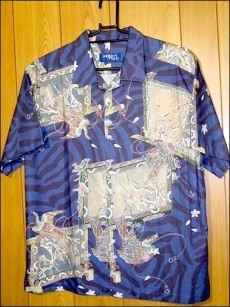 These two advantageous elements are the reasons why I deal with aloha shirt printing." Mr. Okamoto said that he is going to utilize the digital textile printing aggressively with the method which has several hundred years of history, and with his sharp insight as a professional Yu-zen writer. Making use of the good points of both the traditional crafts and the dejital technology, Mr. Okamoto tries to vitalize the industry of Kaga yu-zen. 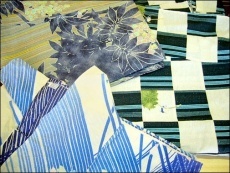 "I think the digital textile printing has a future, but the traditional craft have its original taste. 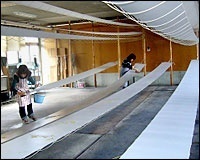 Now, the traditional craft is recognized as a troublesome dyeing method for its maintenance procedure and cost. 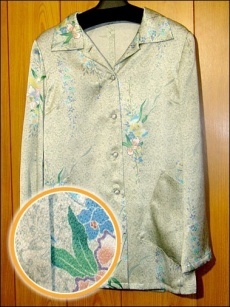 Then I want to make Kaga yu-zen more affordable or easy to wear, and this is achieved by digital textile printing. The difference between hand dyeing and inkjet printing is how my design is reproduced. Offering at reasonable price in which product is similar to the original. That is what we can do for costomers. I think inkjet printer has two ways to use in our industry ― the light one and the heavy one ―." It is the greatest merit that the reproduction of dyeing is possible by the design and printer. However, the reproducibiliy is not keeping up with the traditional method. Mr. Okamoto talks about this point as follows. "At first, 65% was reproduced of the quality of the hand writing , but after I accumulated experiences, now I think I can reproduce 80 to 85%, which is enough to sell the products. It is better that the power of dye enhanced. The power of the dye means, take blue for example, there are several kind of blue such as light blue or deep blue. It is all about the quality, so it is difficult ot explain. I really expect Mimaki's ink, but I heard it is a scientifically challenging task to achieve the level of he traditional craft. However, I recently think that the reproducibility of 85% is characteristic enough." Mr. Okamoto has been exploring into new ground by merging the traditional craft and the digital technology, and now the industry is expanding. "Now, we use the textile printer for shirts mostly. Then, building on shirt printing, we want to create several other things. Actually, we are receiving various kind of orders. I cannot tell about this in detail, but our clients are trying to create things which are barely seen in the market. To make the clients' vision into a reality, I ask a big favor to Mimaki. I think some of the clients' idea will be put into shape. I do not know how much extent the possibility opens up, but the process of design and dye is one of my goal. 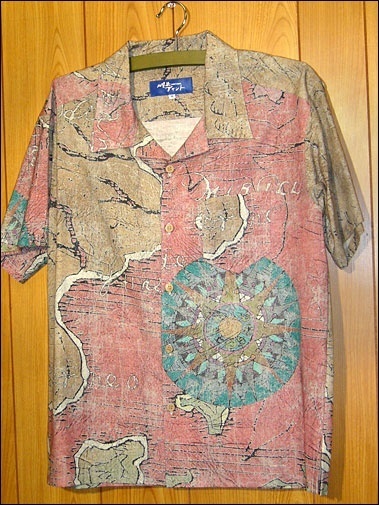 I still think it is like a dream that the design I made is dyed by inkjet printer, not by hand."